What IS “green woodworking” to you? -How did you come to your definition? 1. 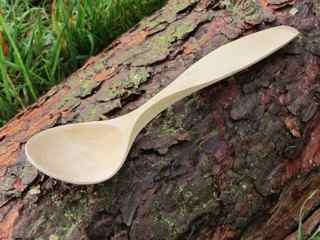 What price including postage should I sell one of my nicely finished eating spoons made from straight wood. 2. How much do you think I should earn per annum as a Spooner working about 20 solid days a month (I think that is quite a nice amount of holidays). Both threads produced an enormous response, which I have read with great interest. Having written a book entitled ‘Green Woodwork’ published in 1989, and having spent one and a half summers with Barn as my assistant, I couldn’t help but respond. I still basically hold with what I wrote in 1989 (Green Woodwork pages 9&10): ‘The phrase that best sums up the type of work I now practice is ‘green woodwork’. In one respect it means simply working with green (or unseasoned) wood. But having learned how to make the most of the extraordinary properties of green wood, I have come to realise that many of the projects can be carried out without the need to rely on powered machinery. this liberation from the noise, the cost and the danger of such equipment gives rise to the other interpretation of ‘green woodwork’: it is energy-efficient, non-polluting and unbelievably fulfilling. 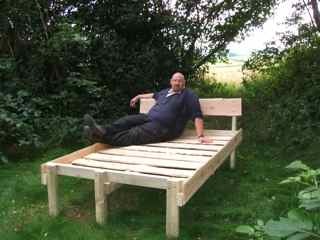 It can be equally enjoyed by the life-served carpenter, the inquisitive novice and the primary-school pupil’. 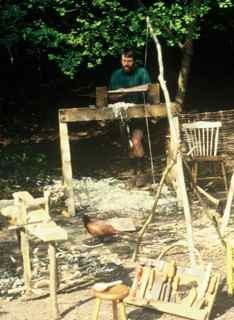 When in 1975 I read Herbert Edlin’s seminal book ‘Traditional Woodland Crafts’ I discovered the craft of ‘chair bodging’, that is using the pole-lathe to turn the legs of Windsor chairs from fresh cut beech trees. I cobbled together a primitive pole-lathe in the attic of the farm-house where I was living, and that became my hobby. Ten years later I took up running green woodwork courses as a means of earning a living inevitably leading me to become involved in trying to formalise training programmes. I have come out of meetings bored to tears having struggled for hours trying to define ‘green woodwork’ or ‘green wood trades’ or ‘coppice crafts’. For 28 years I have managed to eek out a living running woodland courses, where the end product is usually much less significant than the process and the surroundings, both in terms of the environment and the other people involved. Over that time my approach has evolved, and the dear old pole-lathe has virtually become obselete again in my workshop. 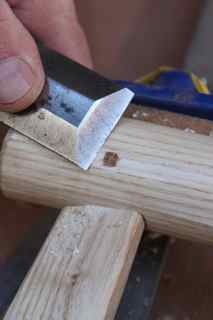 We now use cordless drills and tenon cutters to produce perfect joints every time but we still use the age old craft of cleaving to get the fresh logs down to size. Our ‘lumber horses’ are made out of mass produced softwood, held together with turbo coach screws but the resulting chairs require no glue and no screws, occasionally using a cleft oak peg to hold a joint in place. The important thing for me is that we all enjoy the creative process, and people go away with a fully functional object of which they are proud, which will be a constant reminder of a fulfilling week in the woods. That’s the best definition I can give. As for Barn’s concerns about pricing and the resulting income. 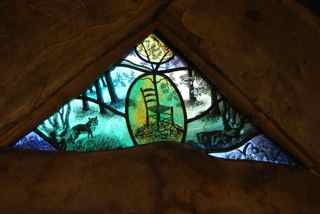 I had a long discussion with my wife Tamsin, who runs a successful business producing illustrated stained glass. There is no simple answer to what price a spoon should be, nor how much a person should earn. It is all down to the individual spoon and the individual person. Tamsin suggested Barn should spend time talking to other full-time crafts-people. Jenny Crisp has been making baskets for many years and has some of her produce in the V&A museum in London but she works away steadily producing beautiful and functional items at a price that most people can afford. 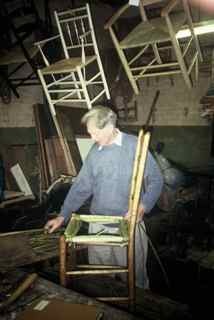 Much the same goes for Own Jones MBE, with his oak swill baskets or Lawrence Neal who took over the chair-making business from his father Neville. We have several items made by Jenny Crisp and Owen Jones in our house along with some of Barn’s spoons and bowls turned on pole-lathes by Robin Wood, Ben Orford, Steve Tomlin, Owen Thomas and James Wilkes. All these items enhance the quality of our lives. It may be that Barn is moving into the realms of artists or celebrities, where the functionality of his output is subordinate to the fact that he made it. Here he could talk to our mutual friend and successful artist, Jackie Morris, who is happy to charge a comparatively high price for one of her paintings – still a lot cheaper than a Van Dyke. Another realm to look at is that of the musician. I remember Richard Thompson (one of the founders of Fairport Convention) saying how fortunate he had been in his career: successful enough to earn a reasonable living but not so famous that he was able to stop working. That seems about right to me. Contrast with Jimi Hendrix, Jim Morrison and many others who maybe made it too big! Steering that line is as much up to fate as it is up to planning but it worth bearing in mind, which is obviously what Barn is struggling with at the moment.